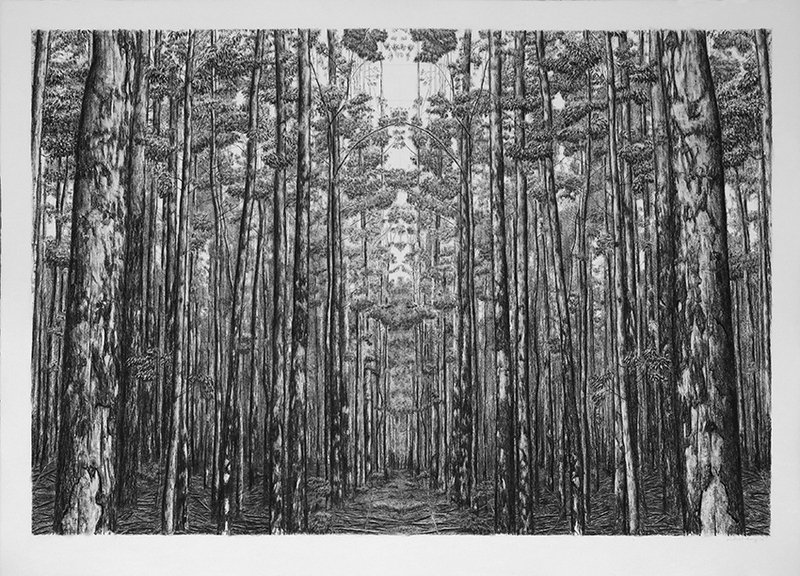 David Krut Projects is delighted to present the first solo show of drawings by Michael Amery. Please join us for a glass of Stellar Organics Sparkling wine for opening on Saturday 16 April, with an event beginning 11am. The show will run until 28 May. 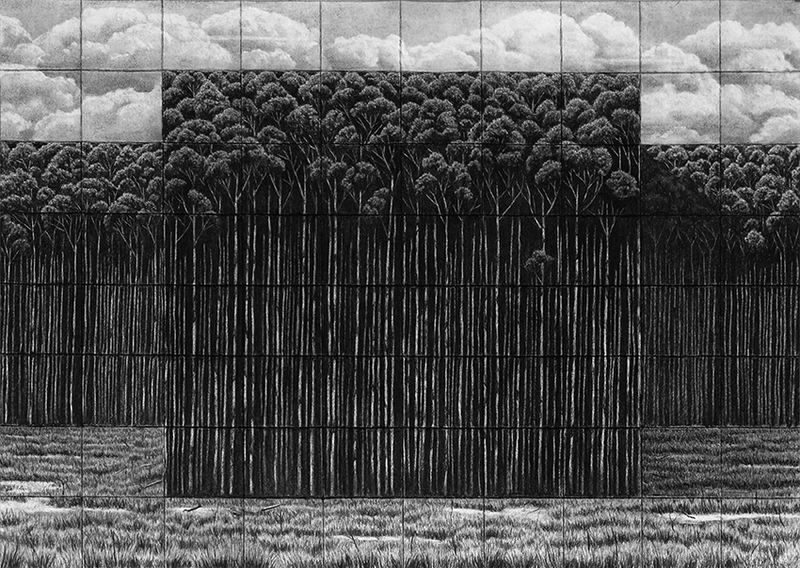 Formally, the techniques that Amery uses in creating the works mimic techniques and systems of industry imposed on the natural world. Symmetry, repetition, calculation: the carving up of the landscape. 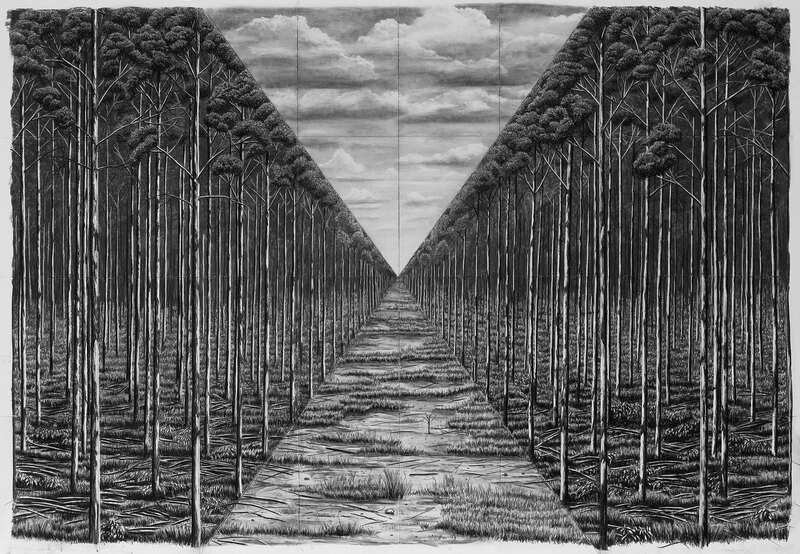 Amery exposes the mechanisms of creation – in some works, the grid used to transfer the image is visible, as a result of folding the paper and allowing the charcoal to collect in the creases as he works. The predetermined pyramidal composition of High Renaissance painting that Amery employs is often revealed and emphasised, the image sliced up and rearranged according to Amery’s will. Sometimes the sky imposes on an area where forest should appear, and clearly demarcated stands of trees close in on an exact mathematical vanishing point. In other works, the one side of the drawing is a meticulous mirror image of the other, recalling Eadweard Muybridge’s early photographic experimentation with ideas of copy/paste cloning, which are so common in the age of Photoshop. 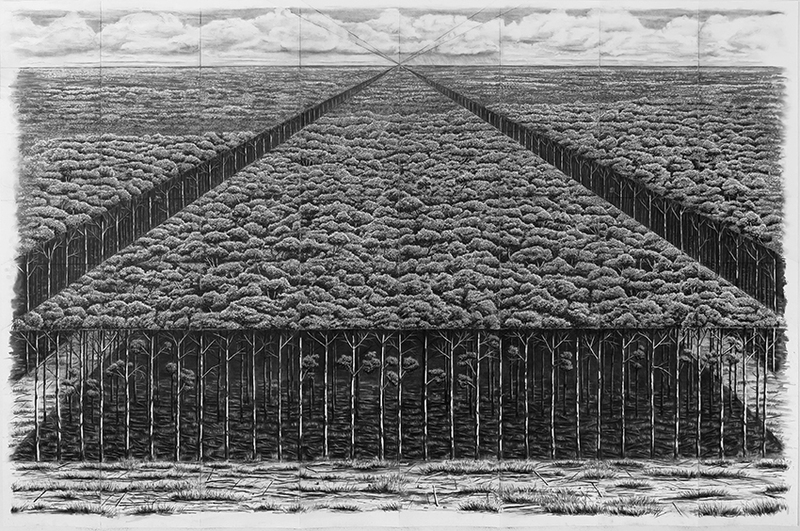 The mirror image, as well as the endless multiplication of almost identical trees ad infinitum produces a subtle comment on the impact of the multiplication of our own species. 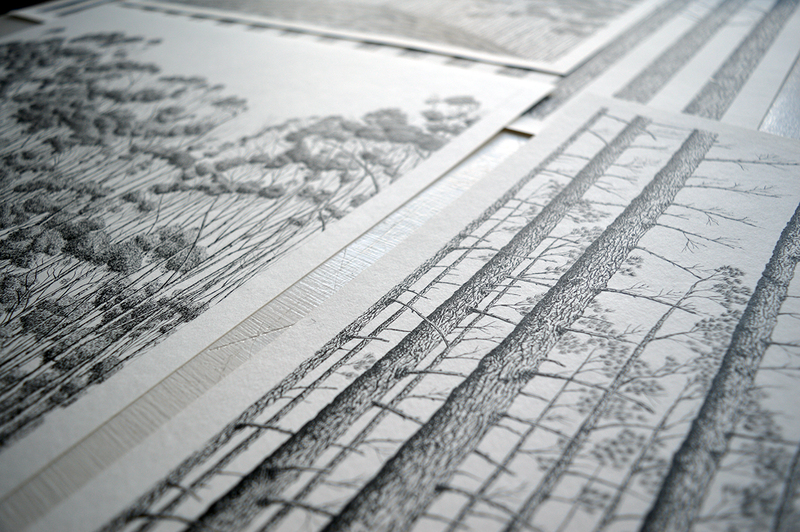 The quiet in the forest is conjured in Amery’s drawings, but the underbelly of the peaceful calm is the danger that monocultures present to the biodiversity that is essential in supporting food production and fresh water in the face of ever-shrinking terrestrial and aquatic resources. The serenity of the natural scenes belies the complexity of their interrogation of consumer culture and its impact on the landscape. For queries on pricing and availability, please contact Jacqueline jacqueline@davidkrut.com. For media enquiries and high res images, please contact Güte gute@davidkrut.com.